Last Sunday, John, Evelyn and I went to Volubilis, site of the ancient Roman provincial capital. The ruins are located somewhat above a fertile valley, offering sweeping views of the surrounding farmland. It was an overcast day, lending a colorless sameness to the ruins and the surrounding area, especially now during the dry season. In spring, when everything around here greens up, the site is supposed to be very beautiful. I can imagine that during Roman times, with a few more trees than there are now, the city must have been lovely. There is actually a lot to see–the remains of bakeries and wine and olive presses, the baths, the capitol building, the marketplace, the sacrificial altar in front of the basilica and many houses with their tiled, mosaic floors still relatively intact. Some of the houses have been given quaint or evocative names, like The House of the Labors of Hercules, House of the Athlete, House of the Dog, House of the Golden Coins, House of the Bathing Nymphs, House of the Columns and House of Dionysus and the Four Seasons. All in all, it’s an interesting site. There weren’t a multitude of other tourists here, though there were a couple of tour buses that left shortly after we arrived. 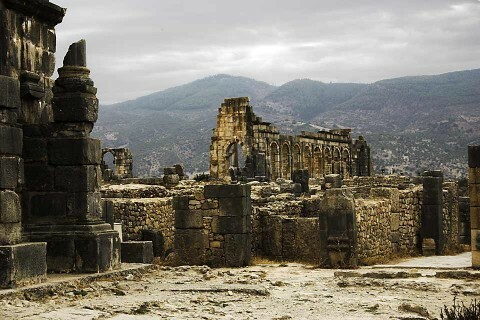 Volubilis is only about 30 km (18 miles) from Meknes and could be a nice day trip by bicycle. Except that it is 1/2 downhill and 1/2 very much uphill! Maybe in the spring I will give it a try. For larger photos, just click on the image. 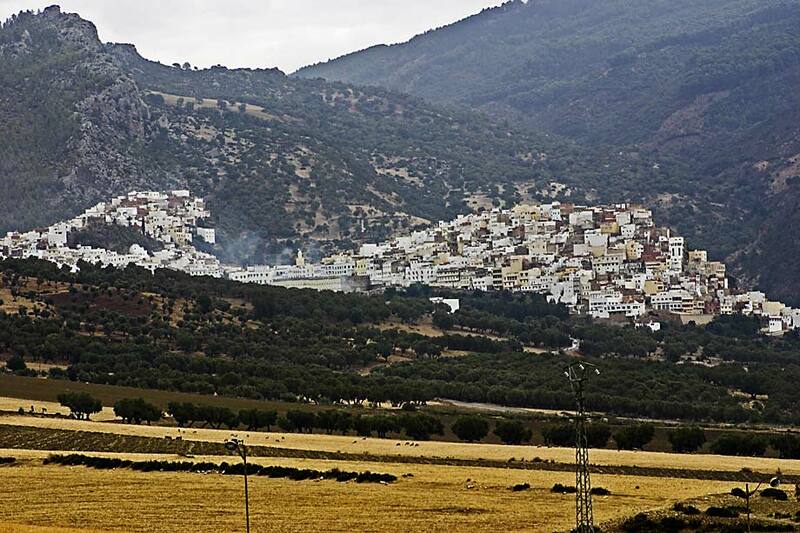 In the mountains to the south clings the small town of Moulay Idriss, one of Morocco’s holiest sites. John tells me that it was only recently that it was opened to non-Muslims. According to one of my guide books, Idriss I fled the caliph in Baghdad in the 8th Century and came here. He founded the first Arab-Muslim dynasty in Baghdad and is buried in the town that took his name. 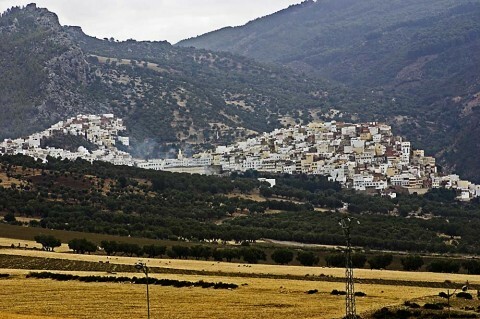 Last Friday, the 14th, John, Nabila Moussamin (the other Fellow in Morocco, based in Tangiers) and I went to the Peace Corps training site at Imouzzer, an hour and a half drive south-east of Meknes. There we trained the volunteers in the use of “Books in a Box,” literally boxes that come with 32 English Language-Teaching books packed inside them. It was great fun working with the PCVs, since I’m a former volunteer myself. They were very enthusiastic about having the books and the workshop was very well received. Imouzzer, over 4,000 feet up in the Middle Atlas mountains, is a smaller version of the nearby resort town of Ifrane. We started the workshop around 12:30 p.m., and as the afternoon progressed, it started to get a bit chilly. Being from Montana, I wore only a short-sleeved shirt, but it wasn’t too bad. I also met a fellow Montanan there, a volunteer named Brian (sorry, Brian, I forgot your last name) from Denton. He also attended the U of M, so we had a lot in common to talk about. It wasn’t all that surprising to meet another Montanan, since the U of M always ranks high nationally in the number of PCVs it recruits. Let’s see. What else is happening . . .? Yanks are out. Red Sox out. White Sox are . . . Holy Pale Hose, Batman, the White Sox are in the Series?! Astounding. Good luck to them. I’ll have to root for them in the Fall Classic, even if Houston, with former Yanks Clemens and Pettite on the team, makes it. More rain this afternoon. The wet season approaches. It got cold last night, so much so that I broke out the heavy blanket that’s been in the closet since I got here. Got my internet connection up and running. It’s not nearly as fast as the speedy Korean connection I had, but it will do. This Thursday, the U.S. ambassador to Morocco, Thomas Riley, will be visiting the American Language Center in Meknes to hand out scholarship awards to 33 Moroccan middle school boys and girls. I’ve been invited to attend the ceremonies and to meet the ambassador. Hmmm, I better buy a suit coat. Then, on Nov. 6, Nabila and I have been invited to give a workshop on the Books in a Box to American Language Center directors and teachers in Marrakech. THAT should be fun–a great opportunity to see one of the legendary cities of Morocco, food, lodging and transportation paid for. Remember “Marrakesh Express” by Crosby, Stills and Nash? (I don’t know whether the correct spelling is Marrakech or Marrakesh–Google gives 4.4 million hits for the latter and 3.8 million for the former.) More later.